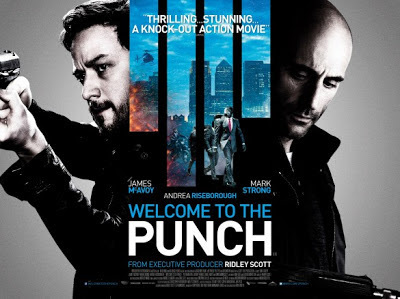 WELCOME TO THE PUNCH is a risibly poor attempt at a Michael-Mann style cop thriller from British writer-director Eran Creevy. Abandoning the social-realist style that gave his first film, SHIFTY, such authenticity and weight, Creevy creates a film that he believes is a hommage, but which reads as cheap pastiche - all slick surfaces, piss-poor Norf London accents, cliche-ridden dialogue and surreal unintentional humour. The slightly built James McAvoy is woefully miscast as gifted but cynical cop, Max Lewinsky, still suffering from a gunshot wound inflicted by criminal mastermind Jacob Sternwood (Mark Strong). Years later, Lewinsky is paired with an admiring and ambitious cop called Sarah (Andrea Riseborough) and is once again brought into conflict with Sternwood when his teenage son is shot, and he comes back from hiding in Iceland. The plot, such as it is, plays as a conspiracy thriller in which politicians and senior policeman are implicated. The only problem is that for the cine-literate, as soon as you introduce a wily campaign manager (Natasha Little) and any senior character played by David Morrissey, we can figure out the entire plot from minute 15 of the film. This kills any potential suspense or engagement with the characters. The fact that they speak in pat dialogue in predictable tab A into slot B scenes doesn't help either. Still, the slick look and feel of the movie is kind of interesting, and you can just about keep entertained until the movie totally jumps the shark in its final act. There's a scene involving gunmen and grandmother that had the audience laughing out loud at the surreal combination - laughing at rather than with. No movie can survive that. WELCOME TO THE PUNCH will be released in the UK and Ireland on March 15th; in the USA on March 27th; in Portugal on April 4th; in the Netherlands and Russia on April 18th; in Japan on May 8th and in Australia and Belgium on May 9th.